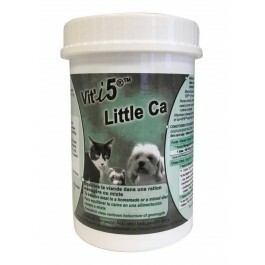 What is Vit’i5 Little Ca? - Dogs, cats and ferrets that are fed homemade diets. - Healthy dogs and cats that are over 8 years of age. - Ferrets of any age. - Dogs and cats of any age that suffer from kidney failure, heart failure or urinary crystals. What are the benefits of using Vit’i5 Little Ca? What is in Vit’i5 Little Ca? Analytical Constituents: Protein: 32% - Ash: 31% - Calcium: 10% - Moisture: 6% - Fat: 1.4% - Phosphorus: <1% - Fibre: <0.5% - Sodium: 0.3% - Magnesium: 0.15%. 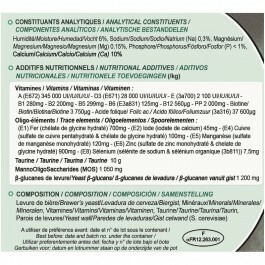 Nutritional Additives:Vitamin A: 345,000IU - D3: 28,000IU - E: 2,100IU - B1: 280mg - B2: 200mg - B5: 299mg - B6: 125mg - B12: 560µg – PP: 2,000mg - Biotine: 3,750µg - Folic acid: 37,600µg. 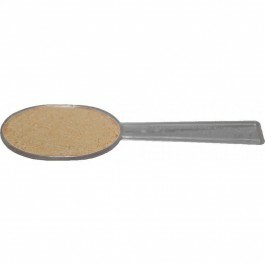 How much Vit’i5 Little Ca should I use? Ferrets of any age:1 dose Vit’i5 per 100g meat or fish. Cats and dogs over 8 years:1 dose Vit’i5 per 100g meat or fish. Cats and dogs of any age with kidney/heart failure:1 dose Vit’i5 per 180g meat or fish. 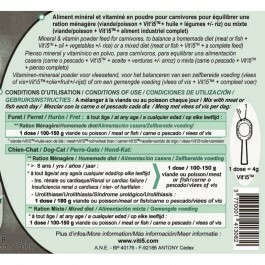 Cats and dogs of any age with urinary crystals:1 dose Vit’i5 per 100g meat or fish. Cats and dogs on a mixed diet (homemade + commercial): 1 dose Vit’i5 per 180g meat or fish.